There have been so many critical and life changing updates at Google search in the past 12-16 months, it’s pretty difficult to ignore. The fact is that businesses are in ongoing panic mode over the fact that many of them have lost 50% of their traffic. Search marketers are running out of logical answers to complicated algorithm questions that only Google knows the real answers to. Amidst all of this pain and suffering, there is a cluster of prospects/clients who still insist on getting those “five to ten” terms ranked on the 1st page of Google. There are people so stuck to the idea of these “competitive terms ranking and making millions” for them that they are willing to bet anything and everything to defend this idea. SEO is no longer about ranking just 5-10 terms on the first page of Google! Even if someone was able to achieve this highly questionable goal, it would not bring the thousands in traffic and millions in revenue. Here I will explain why by detailing the major factors that make “coveting” individual keyword rankings a decidedly worthless strategy. You have probably seen it. 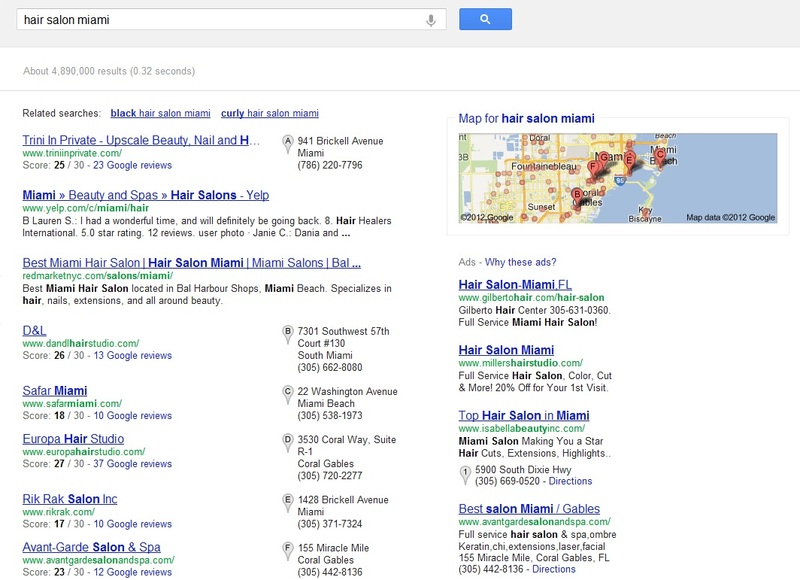 Type “hair salon miami” on Google. (or any city with the same service) What you will see is a list of Google Local listings and AdWords ads dominating the first page above the fold. Google now localizes many search terms including the very competitive terms. 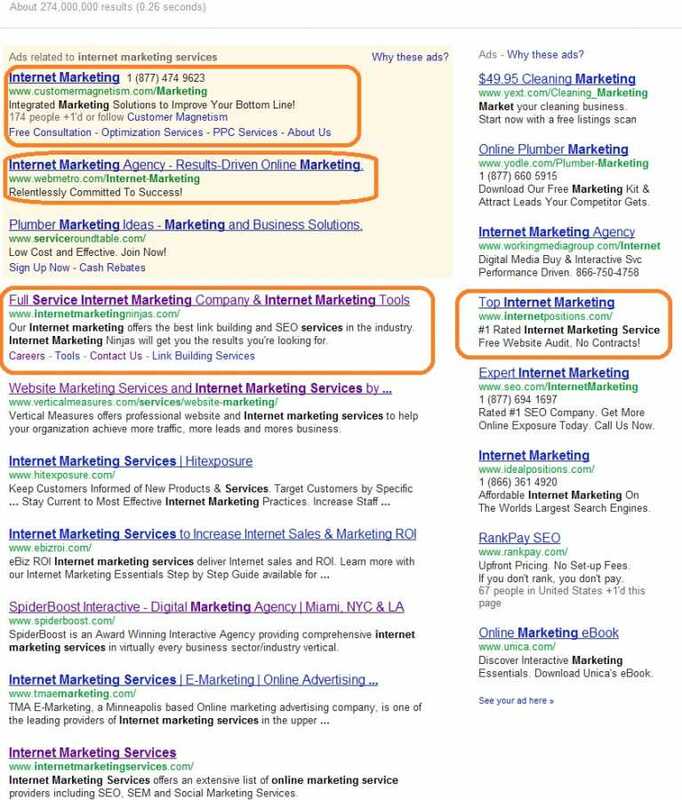 Type “internet marketing services” on Google and see which one of the attached results are the same in your location, as it is here from an IP address in Miami. 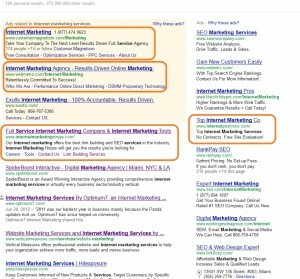 Over 70% of searches are displayed with localized results. This means that the odds of “5-10 terms showing up on Google when searched” diminish greatly. Let’s demonstrate. 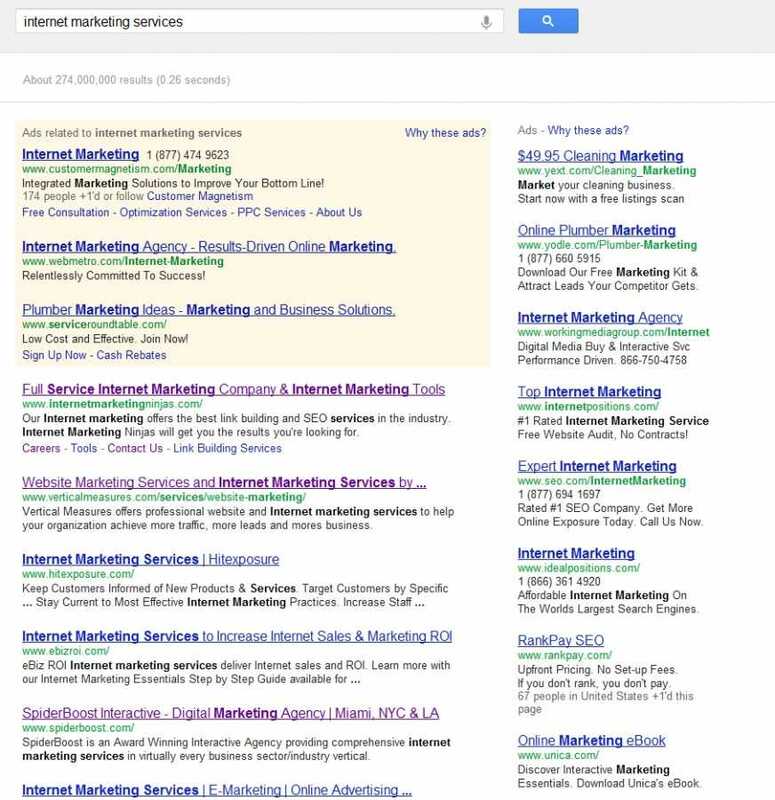 The two screenshots below show the same search for “internet marketing services” from 2 different browsers on the same computer. As you can see 90% of the organic results have changed. Now imagine how much these results would change between 2 different computers, IPs or locations. Clearly, the chance of ranking widely for an individual keyword, much less 5 or 10 keywords, goes way, way down. 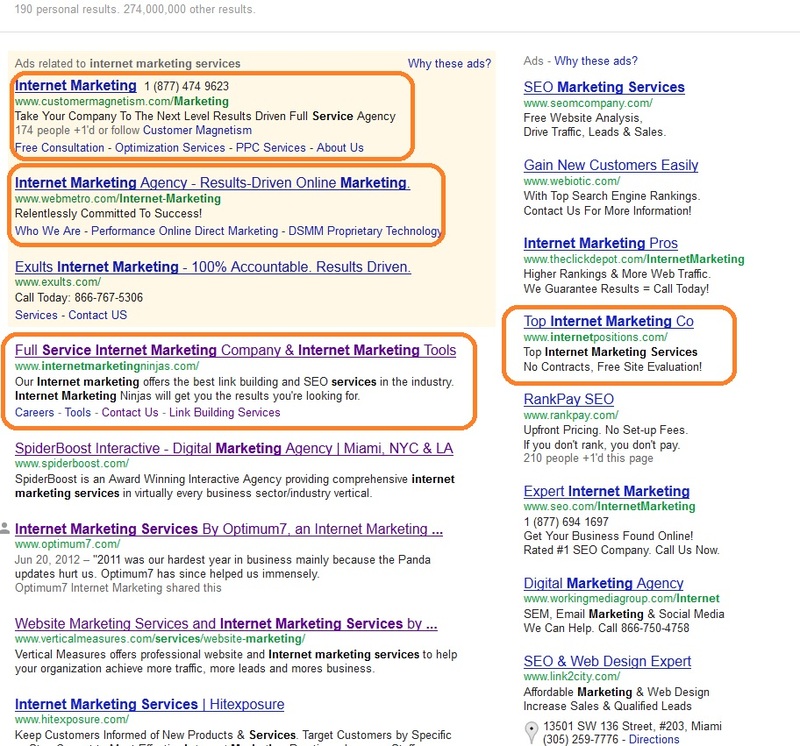 This means that there’s less and less real estate for organic search results. Your 5-10 terms on the first page are much less visible if you are relying solely on vanilla Google Search. Over-optimization happens when a webmaster deliberately arranges the content of a site or a page to rank for a specific term. There’s absolutely no doubt that you will “over-optimize” your site trying to rank for only 5-10 terms. This approach is just not feasible considering how important quality content is for the authority of a site. In other words, you will just shoot yourself in the foot trying to do this. Authority can only be built through “keyword breadth”; the number of unique keywords that actually bring your site organic traffic. Over optimization will cause Google to penalize your site, and you might never get those 5-10 terms ranked on Google. If a user is logged into a Google account while using Firefox, Google searches are automatically encrypted. This means that webmasters cannot see the organic terms users type in Google to get to their sites. If your SEO strategy is to rank for 5-10 terms, you will see very little proof of it actually working in analytics. And the less data you see in analytics, the less intelligent your marketing decisions will be. 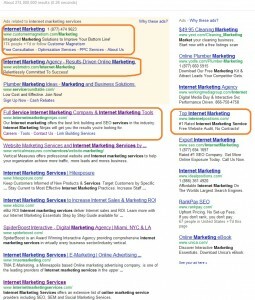 SEO (Search Engine Optimization) in 2012 is more about actual Marketing than anything else. It’s about promoting and building authority for a product or service, through richly diverse online media. Building a site with the right infrastructure -a Google-Friendly CMS such as WordPress, or an Ecommerce Platform such as Volusion is still a key factor. You can’t build anything long-lasting without a strong foundation. Quality and relevant content must be generated on a weekly basis. This means articles, blog posts, infographics, press releases, eBooks, white papers etc. This is the only element that can push your SEO efforts to the next level. Why? Because it’s all about MARKETING now! Authorship Authority settings should be defined accurately for platforms such as Google+. Proficiency in coding is necessary for this process. Backlinks are still very essential to the success of an SEO campaign. However, building backlinks is challenging. They have to be earned naturally, not through gimmicks. Natural backlinks are the direct result of highly relevant, high quality content, mentioned above. Exact anchor texts (link text) might actually hurt your site’s authority. In addition, exact anchor text (link text) refers to repetitive use of use of exactly the same text to describe a link to the search engines. This is a prime example of over optimization. Reviewing backlink profiles is a key process now. All the backlinks that were ever acquired for a specific website must be analyzed and bad/spammy backlinks must be removed ASAP. MicroData and rich snippets are lines of code that make it easy for search engines to crawl the information within your site. Microdata makes a big difference in SEO. If you do not know how to implement them, ask for professional assistance. SEO is not only about content and backlinks anymore; it’s about authority and quality conversations. Who is talking about your brand, products and services? Who appreciates and understands your work? 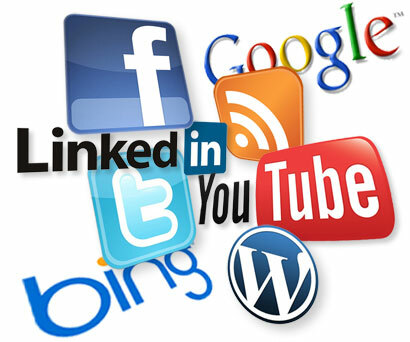 Social media platforms such as Facebook, Twitter, LinkedIn, Google+ and Pinterest promote your business through your following. They also benefit your SEO and ranking efforts through what Google calls “social signals”. Social signals are metrics such as “Twitter retweets” or “Facebook likes” for a specific page. If you do not think that you have to be present in social media, think again! What are you really good at? What is your expertise? Do others know about this? How do you let them know? Are you doing online press releases? Do you build relationships with influential people in your industry? Do you speak at industry events? Do you pitch your story and ideas to online media outlets? Do you share the awesome things you are doing in your industry through Facebook, Twitter, LinkedIn and other similar social media sites? If the answer is no, you are not influential and you are not really trying And if you are not influential, you will never rank for those 5-10 terms. Yes, I’m aware of the fact that we are talking about SEO. However, there’s only one way to do retargeting, and that’s through PPC. Re-targeting is when a business only targets the users who have been on its web site previously. Let’s say Sue searches for “seo services” and finds Optimum7.com. She does nothing, reads a couple of articles and leaves the site. The next day, Sue logs in to Gmail to check her emails and there she sees a link advertisement from Optimum7. Then, she goes to Yahoo to read the news and there she might see a banner ad from Optimum7. Retargeting keeps your brand name in front of potential customers. If the buying cycle for your products or services is longer, this works to your advantage. You will be right there when that prospect who visited your site 30 days ago is ready to buy. There is much more; lead tracking challenges, sales process challenges, ecommerce considerations, copywriting factors. But I think you get the point. SEO is not about ranking for a few terms on the top of search engines; it’s much more than that. It’s a marathon, not a sprint. Google has surely shown us what they envision for SEO to be with their most recent updates. It’s a bloodbath out there with business owners suffering from losing half of their traffic and online business. Do you still think that ranking for 5-10 terms will save your business? Think again. And contact us today, we can help!